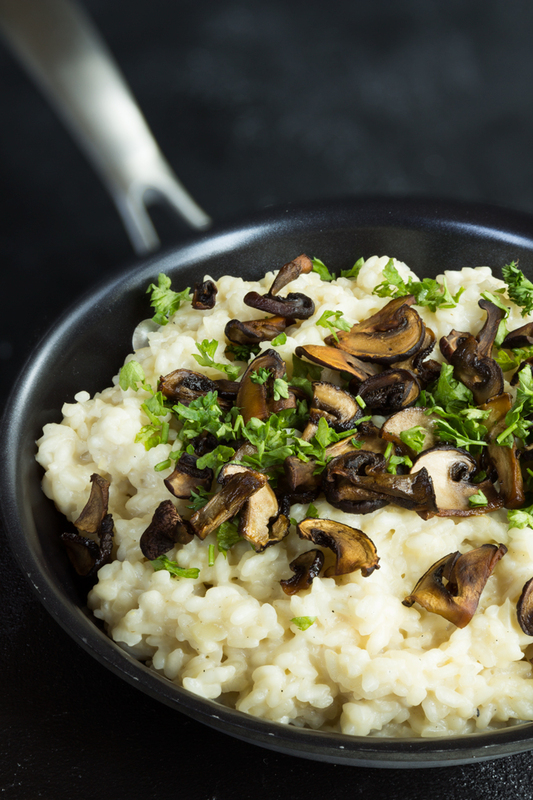 Vegan risotto can be tough to make since traditional risotto recipes call for a lot of dairy. However, it’s not impossible to make vegan risotto that is rich, creamy, and comforting. Wonder how? Read on . . . I clearly remember the first time I had real vegan risotto. It was a couple of years ago when our friend Lindsay came to visit my husband and I. I was pregnant with my first baby at that time and sick as ever. (I don’t handle pregnancies well.) Poor Lindsay assessed the situation and realized that unless he cooks, there’ll be no supper. So he went through my almost-empty pantry, wrote a list of ingredients he needed to make supper, and sent my husband to a grocery store while he headed to a liquor store for some white wine. The next thing I recall was waking up on the couch to the smell of aromatic Italian risotto. Although I was so sick and swore that I wouldn’t even look at food for the rest of my life, I couldn’t resist when Lindsay handed me a bowl of the creamy goodness. I mean, he even made the risotto vegan for us! The only thing I wished was that the bowl was bigger. Both Tanner and I devoured the vegan risotto within a few minutes and couldn’t believe Lindsay didn’t make more! What about leftovers for the next day?! Risotto, in its simplest way, is rice cooked in broth. So, the type of rice you choose is very important. The rice needs to have high starch content and the ability to absorb liquid. Arborio rice is probably the best-known risotto rice and also readily available in pretty much any grocery store. However, it’s also the trickiest type of rice to work with because it easily overcooks and the grains are more likely to break. Carnaroli rice has short, plump grains like those of arborio rice. Like arborio rice, carnaroli grains are high in starch, producing creamy, sauce-like consistency. Because of its rather firm grain, carnaroli is very forgiving to cook with – it doesn’t matter too much if you stir it constantly or leave it unstirred for an extended period of time. However, it’s also much harder to find in a grocery store. Vialone nano rice has a medium grain, and is shorter and thicker than arborio. It absorbs more than twice its weight in liquid, is nearly impossible to overcook, and is perfect for creating a very hearty risotto. 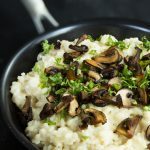 My favorite type of vegan risotto is mushroom risotto so I always use mushrooms. I would argue that the best type of mushrooms for risotto are chanterelles. They are not easy to come by in most groceries and even specialty stores won’t carry them year ’round. However, they have a wonderful meaty flavor and even a little bit goes a long way. Actually, any wild mushrooms are pretty awesome. However, since wild mushrooms aren’t always available, I use brown crimini mushrooms most of the time. They are much more flavorful than white mushrooms, have an earthy taste, and just like chanterelles – come with a meaty flavor. Shallots have a sweet and mild flavor with a hint of garlic, and lack the bite you get with yellow or white onions. Shallots work particularly well in recipes where you don’t want an overpowering onion flavor – like risotto. If you don’t have shallots, you could use sweet onions instead. I just find that shallots always turn savory recipes into something really special. Next up is wine. You need so little wine for risotto that it doesn’t really matter which one you use. For those of you who don’t have any use for the wine other than the risotto (my husband and I don’t drink, for instance), dry vermouth is a great choice because it keeps well in the fridge and hardly ever spoils. If you consume wine regularly, you can use whatever you’re drinking at that moment. And if you prefer to omit the wine altogether, use more broth with a splash of lemon juice in its place. The wine isn’t an essential ingredient, but it definitely adds a depth of flavor to the final dish. As I already mentioned, vegan risotto – in its simplest form – is rice cooked in broth. I usually make vegetable broth myself, using whatever extra vegetables I find in the fridge or the freezer. The reason I don’t like store-bought vegetable broth is that it’s usually of a low quality. Rather than relying on fresh vegetables and herbs for flavor, commercial broth often relies on flavor enhancers, like MSG, natural flavors, salt, disodium inosinate, and more. What’s even more important is that even if the ingredient label lists only vegetables, the likelihood of the manufacturer using fresh whole vegetables is pretty low. lthough shallots caramelize like onions, they overcook easily. So it’s important to sauté them slowly over low heat or else you risk that you overcook them, resulting in a bitter taste instead of sweet. Another thing to keep in mind is that if you brown the shallots too much, they will color the dish. So keep an eye on them. Some chefs suggest removing the shallots from the pan before adding the rice (to prevent further browning), some say it’s ok to keep the onions in the pan. Whichever route you decide to go with, toast the rice over low heat. Don’t allow the rice to brown because it would lock the starch in, preventing the rice from getting creamy. The grains should be just heated through so the wine sizzles when you add it into the pan. Wine, other than adding a depth of flavor, helps to tenderize the rice. Don’t forget to warm up the wine before adding it to the rice. As a chef Gabriele Ferron (who travels the world giving risotto demonstrations in top restaurants) says, “if you add cold wine, you shock the rice, which will flake on the outside and stay hard at the core”. Let the wine evaporate completely and then begin to add the hot broth. Stirring the rice while adding hot broth is called the risotto method. You’ll need two hands – one for stirring and one for ladling. The constant stirring while slowly adding the broth is what releases the rice’s starches, producing a creamy, velvety dish. If you pour all the broth into the pan at once, you’re just boiling rice. Keep the broth at a rolling boil and always wait until the rice absorbs all the broth. Then add some more. Don’t let all the broth evaporate though. If the grains get too dry, they’ll flake. The finished rice should be al-dente with just a little bit of bite to it. Just as a side note, a food writer Richard Erlich makes a case for a more hands-off approach to risotto. “You can cook perfect risotto with just occasional stirring, and you can also do it in the oven, the microwave, or a pressure cooker”, he says. However, I have never been able to do it that way myself. Without stirring, my final dish always looks more like a pilaf rather than a risotto. If you’re adventurous, you can give a try though. If you’re making risotto with vegetables, cook the veggies in a separate pot and add them to the rice at the end of cooking. This is especially important for tender vegetables, such as leafy greens, mushrooms, or asparagus. 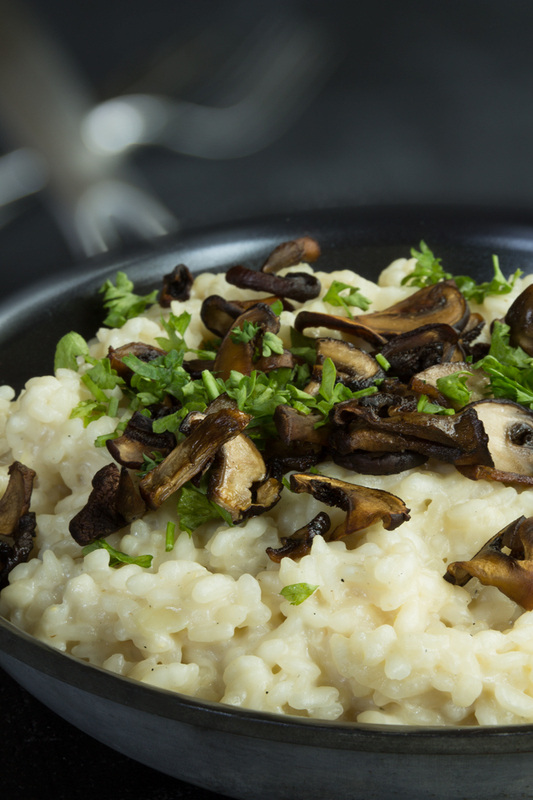 You don’t want anything mushy in your risotto. rown the mushrooms. Hear me out on this one, please! Get the pan pretty hot, add a splash of olive oil, then add the mushrooms, and back away. Don’t stir the mushrooms! The secret to really flavorful mushrooms is a caramelized crust and that only happens with high heat and no stirring. After about 3 minutes, check the bottom of one mushroom and if it’s not golden yet, flip it back until you see some color going on. Obviously, you’ll need a big enough pan so all the mushrooms fit in one layer. 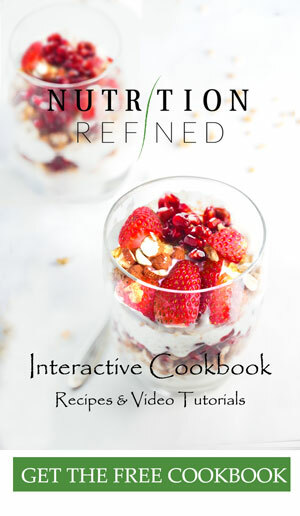 Nutrition Refined is a participant in the Amazon Services LLC Associates Program, an affiliate advertising program designed to provide a means for us to earn fees by linking to Amazon.com and affiliated sites — at no extra cost to you. Thank you for your support! Creamy, savory, and comforting risotto with a vegan twist. Topped with mushrooms, garnished with some chives, and sprinkled with black pepper, this Italian classic is the ultimate comfort food. In a small saucepan, heat up the vegetable broth. Keep it hot on the stovetop. In the meantime, heat 1-2 Tbsp. (15-30 ml) of olive oil in a 10" (25 cm) skillet over medium-high heat until shimmering. Add the sliced mushrooms. Stir to coat and let them cook over high heat without touching them for at least 2-3 minutes. Flip and repeat until golden on all sides. Season with salt and pepper, and set aside. Heat 1-2 Tbsp. (15-30 ml) of olive oil in a heavy 12" (30 cm) skillet over medium-high heat. Add the shallots and garlic and stir until slightly translucent and fragrant (do not brown the shallots). Then add the rice, stirring and tossing frequently until the rice has begun to take on a pale golden blond color and nutty aroma, about 3 minutes. Don't let the rice turn brown. Add dry white wine and stir gently. Cook for 1-2 minutes or until all the liquid has evaporated. Using a ladle, add about 1/2 cup (120 ml) of hot vegetable broth to the rice at a time while continuing to stir the rice. When the rice appears almost dry, add another ladle of broth and repeat the process. It's important to stir constantly and add the next ladle as soon as the rice is almost dry. As the rice cooks, it will release its natural starches and start taking on a creamy consistency. The risotto is ready when the rice is al-dente and still somewhat firm to bite (after about 20 minutes). If you run out of broth and the risotto still isn't done, you can finish the cooking using hot water. If you're using unsalted broth, season the risotto with some salt and pepper. 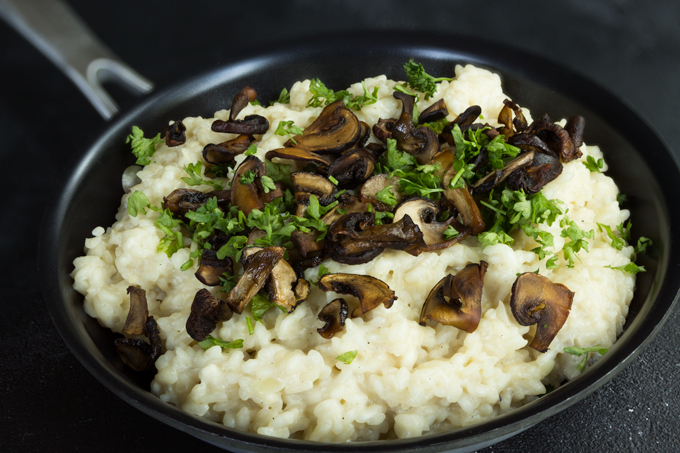 Serve the risotto hot, topped with the fried wild mushrooms, garnished with some chopped chives (or Italian parsley), and sprinkled with some black pepper. Store leftover risotto covered in the refrigerator for 3-4 days. To reheat, for every 1 cup risotto, bring about 1/4 cup (60 ml) vegetable broth to a boil on the stove in a pot large enough to fit the risotto. If you don't happen to have broth on hand, water can work in a pinch. Add the risotto and stir it for a few minutes until the rice warms up. If the risotto is still quite thick, you can add a splash or two more broth, as needed, to loosen it up. *If you don't like wine, you can add more vegetable broth and a splash of lemon juice instead. **Wild mushrooms are hard to find and can be pretty pricey. You can easily substitute them for some classic brown crimini or portobello mushrooms. I'm Petra, a Holistic Nutritionist and Raw Food Chef. I share plant-based, gluten-free, and refined sugar-free recipes made from whole foods.